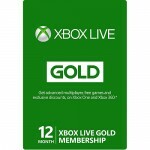 Groupon.com has 12-Month Xbox Live Gold Membership Card for $49.99 – $10 w/ promotion code 10FORU or HAPPY10 = $39.99. Shipping is free. With Gold membership in Microsoft’s online service, gamers can jump online to grab free Xbox 360 or Xbox One titles or simply kick back and watch the Netflix app. A year of Gold unlocks the full potential of the console, letting users play competitive games online, stream HD TV shows and movies, and claim exclusive discounts on digital content. Owners of the Kinect or Xbox One can use voice controls to search the web or command the machine to sing “Daisy Bell.” A host of newly-accessible apps ranges from Skype and Internet Explorer to entertainment portals such as Hulu and Redbox Instant.